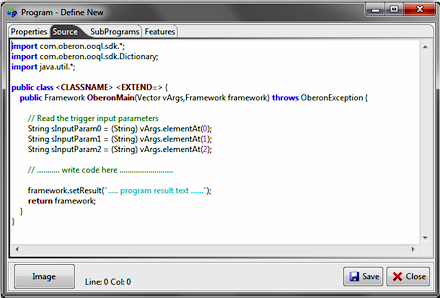 A program source code implements the ProgramCode SDK interface. The <CLASSNAME> tag is automatically replaced with the program name during the compilation while the <EXTEND=..> tag can be used to extend another program [class] with this class. Programs are very important to extend the platform functionalities and developers often deal with program code generation. 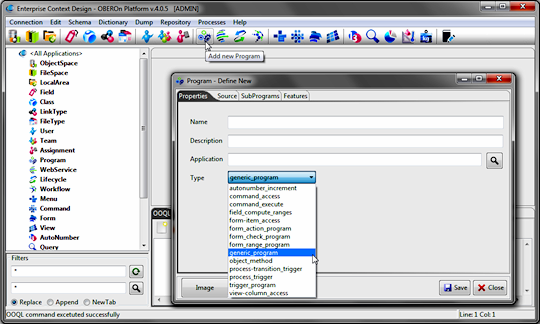 A set of program templates are included inside the OBEROn resource/models folder to accelerate this process; these models are java source files (with .java extension) and implement the program interface for the different purposes. When you add a new program in the Context Design admin client, the creation form proposes the list of program types by reading this folder. So, when you select a specific type, the file content is loaded into the Source tab and you have only to write the core part of the program. You can define your custom models and save them inside the same folder, the name of your template files will appear in the type list, togheter with the default models. These programs are usually used when the item field ranges depend on the form where they are employed or when the item represents a basic or a action field. In these cases is not possible to use the field range program. They can be also executed with a AJAX call to the com.oberon.ooql.rmi.JRFormValidateServlet posting the item values into the http xml request.